Foras na Gaeilge, Údarás na Gaeilge, Maorláthas na Gaeilge….cad faoi Aontas na Gaeilge? ‘Shake up’ a thugann an ceannlíne sa scéal seo sa Sunday Tribune ar an méid atá á rá go poiblí ag Eamonn O Cuív faoin phlean atá ann ról níos leithne a thabhairt do Udarás na Gaeltachta. Is cosúil gur Udarás na Gaeilge a bheidh air má ghlactar leis an bplean atá á phlé faoi lathair ag an bhfo-choiste Comh-Aireachta i leith na Gaeilge. D’fhéadfadh seo a bheith ina thús nua do chúrsaí na Gaeilge sna 26 contae – ach is ansan atá an fadhb is mó leis an mbeartas. Ní h-aon chara mise le Foras na Gaeilge ach bunaíodh an Fhoras mar institiúid uile oileánda chun an Ghaeilge a chur chun cinn. Anois tá orthu dul san iomaíocht leis an Udarás seo nó tá orthu focas as an úr a chur ar ghnóthaí tras teorainn. Tá sé deacair a dhéanamh amach cá thosnaíonn ‘tras teorainn’ agus cá chriochnaíonn ’26 contae’. An oiread is go bhfuil sé ina chur amú airgid go bhfuil dhá chóras sláinte ar an oileán agus dhá chóras oideachais le cois – nach cur amú é go mbeadh dhá institiúid stáit ann chun an Ghaeilge a chur chun cinn? Dhá mhaorláthas, dhá runaíocht. Ag an am chéanna, beidh an tua ag titim ar na h-eagrais Ghaeilge, leithéidi Conradh na Gaeilge agus Gaelscoileanna. Ar ndóigh d’fhéadfadh seo tochailt faoi bhunús Chomhaontú Aoine an Chéasta – agus cé nach gcreidim gur bó beannaithe é an Chomhaontú céanna, is cinnte go gcaithfear a chinntiú nach bhfuil leithscéal á thabhairt d’Aondachtaithe atá nimhneach in éadan na Gaeilge, leithéidí Nelson McCausland, Aire Cultúr an Tuaiscirt, cúlú ó dhualgaisí an staitín ó thuaidh i leith na Gaeilge. Foilsiú: 16/11/2009 . igaeilge a d’fhoilsigh. Ranganna: An Ghaeilge, Cúrsaí Reatha, Cultúr. Clibeanna: An Ghaeilge, Maorláthas Ar Mire. Tá roinnt bileoga tagtha chugam le linn an fheachtais seo – agus a bhfurmhór is isteach sa bhosca athchúrsála a théann siad. Ach tháinig chugam ó Thoireasa Ferris, iar Mhéara Chiarraí agus bean óg atá gealladh fuithí, atá san iomaíocht thar cheann Shinn Féin a mheall mo shúil. Ar ndóigh is bean dathúil í Toireasa – ach ní h-é sin an fath go raibh mé tógtha faoina bileog. Níl morán ar an mbileog i nGaeilge – cúpla manna anseo is ansiúd ach tá teachtaireacht laidir sa mhéid atá ann. “Mar gur fiú níos mó ná biorán thú”. An manna i mBéarla, a chomhionann is dócha, ‘Sinn Féin – because you deserve better’. An rud amháin faoin leagan Ghaeilge, níl sé chomh leamh is a bhíonn furmhór na mannaí toghcháin: ‘A strong voice in Europe’ is a leithéid. Tá alt spéisiúil san Irish Times i dtaobh Toireasa ag Harry McGee a bhí ar an gcanbhas lei i gcathair Chorcaí agus, mar is é seo an dualgas atá ar iriseoirí an Irish Times, bhí ar iarracht éigean a dhéanamh í a cheangal le stair fhoreigneach a páirtí. Le bheith cothrom do Harry bhí an alt níos measta ná an ceannlíne – More Armani than Armalite – cé nach gcreidim go bhfuil daoine fós ag baint ceoil as seana phort sin! Bhí an cheist ann faoin uair gur dhiultaigh sí cáineadh a dhéanamh ar mharú an Garda Gerry McCabe in Ath Dhara i 1996 nuair a bhí ar an Late Late Show. Agus thug sí an freagra ceart ar an gceist – baineann sin leis an stair agus an uair ar thárla sé, ní raibh sí ach sé bhliain deag d’aois. Nach mbeadh sé chomh maith ag iriseoirí na linne seo bheith ag iarraidh ar Fhianna Fáil dúnmharú Mhichíl Uí Choileáín a cháíneadh? Tá amhras orm i gcónaí faoi Shinn Féin, go h-áirithe an eite thuaisceartach den pháirtí agus an caidrimh lofa atá acu leis an DUP. Agus ní thaithníonn caint débhríoch Mary Lou liom nó port Phiarais ach an oiread. Ach táim ag ceapadh go bhfuil seans mhaith ag Toireasa. Neosfaidh an aimsir. Bheadh sé go maith dá nglacfadh glúin óg is oilte seilbh ar an bpáirtí sara n-iompaíonn sé go Fianna Fáil…. Foilsiú: 26/05/2009 . igaeilge a d’fhoilsigh. Ranganna: An Ghaeilge, Cúrsaí Reatha, Nuacht. Clibeanna: An Garda Gerry McCabe, An Ghaeilge, An Ghaeilge agus Toghchán 09, Fianna Fáil, Late Late Show, mannaí toghcháin, Mícheál Ó Coileáin, seanfhocail, Sinn Féin, Toireasa Ferris. Tá scannán ag teacht inár dtreo go luath faoi Eirí Amach 1916, Easter Sixteen. Ach tá rabhadh ‘sláinte’ á thabhairt ag an starai, Lord [Paul] Bew, faoin scánnán seo nó ceapann sé go gcothóidh sé agus go spreagfaidh sé ‘easaontóirí’. Did that play of mine send out good men the English shot? Tá cluiche aisteach á imirt anseo ag leithéidí Bew agus athscriobhaithe eile na staire. Feictear domsa gurb iad is mó atá ag cothú na h-easaontóirí agus iad ag iarraidh a thabhairt le fios tre talamh tirim a dhéanamh go bhfuil Sinn Féin anois ag cur riail na Breataine i bhfeidhm in Éirinn gur easaontóir gach duine nach n-aontaíonn le SF. Ar chúinse ar bith. Níl sé chomh simplí sin an dubh a chur ina gheal ar dhaoine. I mo chás féin: Is poblachtóír mé sa chiall is leithne den bhfocal. Ní aontaím le Sinn Féin faoin cur chuige atá ag an phairtí i leith na Gaeilge. Tá díomá orm faoi easpa cumais is éifeacht an phairtí san Fheidhmeannas ó thuaidh ach ní chiallaíonn sin go bhfuilim ag easaontú, mar shampla, leis an gcinneadh bheith páirteach san Fheidhmeannas ó thuaidh ar bhonn phrionsabail. Bhí gá leis an dul sa tseans sin – fiú murar eirigh leis go dtí seo nó mura n-eiríonn leis go ceann i bhfad. Nó is fearr é sin ná an rogha eile, an rogha fuilteach dúnmharfach náireach a léiríodh dúinn roinnt seachtainí ó shin nuair a maraíodh poilín agus beirt shaighdiúir ó thuaidh. An cluiche atá á imirt ag leithéidí Bew síol an amhrais a chur ag fás is a chothú i measc gach cineál poblachtóír ar mhaithe le scoilteanna a chruthú agus a chothú ar an dtaobh sin. 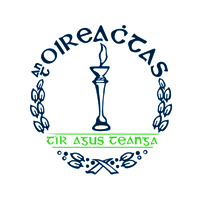 Tá seo á dhéanamh le go mbeadh scoilteanna ar an dtaobh náisiúnach poblachtach Éireannach mar atá ar an dtaobh Aondachtach Dílseach Briotanach. Íonsaí faoi choim atá ann ar Shinn Féin, ar ndóigh, mar go dtugann sé le fios go bhfuil an páirtí sin ‘ceart go leor’ anois i súile na nAondachtóirí. Tuigeann leithéidí Bew gur mioscais atá ar bun acu, cheapfainn, nó ba cheart go dtuigfeadh Ollamh le Polataíocht in ollscoil ar bith, fiú Ollscoil na Ríona, gur amhlaidh an scéal. Tá sé feicthe agam go bhfuil iarracht déanta ag roinnt daoine a easaontaíonn le SF ar cheist na Gaeilge a lua le h-easaontas níos ginearálta le SF. Mar a dúirt ní féidir bheith chomh dubh agus bán le sin ar cheisteanna dá leithéid. Ní imeartas focail atá ar bun agam nuair a deirim nach n-aontaím le SF ar nach mór gach rud atá ar bun ag an phairtí faoi láthair agus le tamall anois ach ag an am chéanna go ndeirim ós árd nach easaontóir mé. Is fuath liom rogha an doirteadh fola, an t-aon malairt ar an réimeas láithreach atá á thairiscint ag na h-easaontóírí. Idir an dhá linn, táim ag súil go mór leis an scannán nua seo faoi 1916. Níl a fhios agam an mbeidh sé chomh maith le ‘The Wind That Shakes The Barley’ nó ‘Michael Collins’ nó fiú ‘Michael Collins – The Musical’. Ach taitníonn sé liom go bhfuil iarracht á dhéanamh ag Hollywood an scéal seo a ínsint. Mas mall is mithid. Tá cuimhne agam gurb iad Paul Bew agus athscríobhaithe mar é a thog raic leis an BBC agus RTÉ i 2001 as an chomhléiriú a rinne siad i sraith theilifíse faoi 1916 agus an méid a lean é. Bhí siad ar buile gan amhras gurb é Ronan Bennett, iar chime Phoblachtach atá anois ina scríobhnóir mór le rá, a scríobh an dráma don sraith seo, Rebel Heart. Bhí siad ar buile freisin gur léirigh sé radharc náireach ó stair an RUC, nuair a rinne scuaid den fhórsa náirithe sin íonsaí ar an dteaghlach McMahon agus gach mac mathar acu a mharú ina dteach cónaithe. Eachtra míchlúiteach é sin a tharla i dtús na 1920í agus luaitear an Oifigeach san RUC, John Nixon, leis an eachtra dúnmharfach sin. Ina dhiaidh sin toghadh é ina MP i gceantar na Seanchille i bPairlimint Stormont. B’é Ian Paisley a runaí Phairliminte…. Foilsiú: 19/04/2009 . igaeilge a d’fhoilsigh. Ranganna: An Ghaeilge, Cúrsaí Reatha, Cultúr. Clibeanna: An Ghaeilge, Athscríobhaithe Staire, Easaontóirí, Eirí Amach 1916, Ian Paisley, John Nixon, McMahon Murders, Paul Bew, Rebel Heart, Ronan Bennett, Sinn Féin. An bhfuil an pingin ag titim – nó an é ná bhfuair an comhfhreagraí a d’ullmhaigh an tuairisc seo le h-aghaidh suíomh nuachta an BBC ‘ar an mór thír’ an meamram ó Bhéal Feirste? Sin an cheist a ritheann liom agus mé ag léamh an tuairisc dearfach seo faoin nGaeilge ag an BBC. Sa chéad dul síos, sa tuairisc seo, aithnítear an Ghaeilge mar theanga de chuid na Riochta Aontaithe. Agus bíodh is go gcreidim gur theanga náisiúnta na hÉireann í an Ghaeilge, caithfidh mé glacadh leis – agus glacaim leis go fonnmhar – má tá craoltóir stáit na Breataine á aithint mar theanga dá gcuid. Cuireann sé i gcuimhne dhom na h-amannta go mbionn an BBC ag aithint filí agus aisteoirí is laochra spoirt, leitheidí Séamus Heaney agus Liam Neeson agus Ruairí McIlroy, mar Bhriotanaigh nuair a bhuann siad gradam idirnáisiúnta éigean. Ach má chuireann siad cos as alt, is Éireannaigh iad arís. Má tá an BBC sa Bhreatain sásta an Ghaeilge a aithint mar theanga de chuid na Ríochta Aontaithe, an bhfuil aon údar acu cur i gcoinne an argóínt gur cheart don BBC caitheamh leis an Ghaeilge i dtuaisceart Éireann mar a chaitheann an BBC leis an Bhreatnais sa Bhreatain Bheag nó an Ghaeilge in Alba? Agus tabhair faoi ndeara rud eile faoin tuairisc seo, tá an Ghaeilge á lua gan ‘andulsterscots’ bheith luaite amhail is gur chuid den fhocal amháin iad ‘Irish’ agus ‘andulsterscots’. Professor Colin Baker from the University of Bangor is an expert in bilingual education, and says bilingual children have an advantage in terms of intelligence. “They actually have a higher IQ,” he said. Samhlaigh an aischothú a spreagfadh an ráiteas sin dá luafaí é ós ard ar fhóram, leitheidí ‘slugger o’toole‘! Bheadh daoine le ceangal. And he believes the ability to speak more than one language makes children more tolerant and accepting. Foilsiú: 12/02/2009 . igaeilge a d’fhoilsigh. Ranganna: An Ghaeilge, Nuacht. Clibeanna: An Ghaeilge, An Ríocht Aontaithe, BBC. Ní go dtí inné ar léigh mé den chéad uair an moladh is déanaí faoi chúrsaí Gaeilge ón Aire Ghnóthaí Pobail, Tuaithe is Gaeltachta. De reir phríomhscéal Foinse [anois agus Lá Nua imithe nach bhfuil sé in am go n-eireodh an nuachtán sin den seafóid ‘príomhnuachtán náisiúnta na Gaeilge’, an teideal a thugann an nuachtán do féin, amhail is go bhfuil nuachtán eile ann] tá an tAire ag moladh go mbeadh Udarás na Gaeilge ann chun féachaint i ndiaidh cúramaí Ghaeilge sa Stat ó dheas. Dar leis gur laincis ró mhór air féin agus an Stat go bhfuil foras tras teorainn i mbun na teanga ar an oileán. Gan dabht, os rud é gur ar Fhoras na Gaeilge atá sé ag caint, tá an ceart aige. Ach níl an Fhoras ina bhac ar fhorbairt na Gaeilge san taobh ó dheas den tír amháin nó is constaic é ar chruthaitheacht is eile sa teanga ar fud na hÉireann is gach aon áit ina labhartar an teanga. Ag fágaint ar leataobh ceisteanna faoi eifeacht an Fhorais [agus níl aon cheist faoi sin – is foras chun dochair na teanga é] agus na crioch dheighilte [ní luíonn sé le ciall an dream is mó ar suim leo an teanga a scarúint ó dhlínse an údaráis nua seo], tá ceisteanna eile le freagairt. Más amhlaidh, mar shampla, go mbeadh ionadaithe le toghadh ag an phobal ar bhórd an údaráis seo, faoi mar atá d’Udarás na Gaeltachta, bheadh buntaiste eigean ann don phobal. Bheadh rud ann nach bhfuil ann maidir leis an bhForas – cúntasacht. Ní féidir le Foras ar bith a rá go bhfuil siad freagrach don phobal más amhlaidh nach feidir leo cúntais a fhoilsiú go poiblí gach bliain. Ba don bhliain 2003 go deireannach a d’fhoilsigh Foras na Gaeilge a gcúntais. Ach an féidir a rá go bhfuil an ciall le maorláthas eile a bhunú chun riar a dhéanamh ar an nGaeilge? Nach bhfuil an ceacht sin foghlamtha againn? Is maorláthas é Foras na Gaeilge agus is ionann é agus lámh marbh ar an dteanga. Is é nadúr an mhaorláithis faisceadh an bháis a bhreith ar an ábhar atá á mhaorláithiú acu agus é a mharú ar mhaithe leis an mhaorláthas a bheith beo. In áit bheith ag iarraidh roth pollta agus cam a athchruthú, ba cheart maoiniú ceart a thabhairt do na h-eagrais atá ann agus na feidhmeanna atá acu a rá go soiléir le go mbeidh na h-eagrais agus pobal cinnte faoi céard atá ar bun. Foilsigh plean – nó léarscáil más fearr leat – a leireoidh an pointe tosaigh agus an ceann scríbe agus roinnt moltaí faoin mbealach le tabhairt faoin dturas – agus ansan fag ag na h-eagrais na bealaí is eifeachtaí go ceannscríbe a bhaint amach. Tá ceist na criochdheighilte ag croí na deacrachtaí atá agam leis an moladh seo. Má tá fadhbanna ann maidir le polasaí na Gaeilge ar bhonn tras teorainn, ar an mbonn go bhfuil aire frith Ghaeilge i mbun an roinn leis an gcúram sin air ó thuaidh, bhuel is cinnte gur constaic é sin. Ach ní leithscéal é chun pobal na teanga a fhágáíl leo féin. Nach aisteach an scéal é go roghnaíonn an tAire an am seo, nuair atá guth an tuaiscirt tostaithe ag Foras na Gaeilge, chun a thuairim crioch dheighilteach a chur chun tosaigh. Níl de leithscéal ag an Aire – agus is leithscéal réasúnta é cheapfá – nach féidir airgead poiblí a thabhairt do dhream chomh mí eifeachtach le Foras na Gaeilge. Ar ndóigh is é an tAire féin a cheap comhaltaí an Fhorais. Eisean, in éineacht lena leathbhádóir, Greagóir an Bhéil Chaim, atá freagrach as an maorláthas ar mire atá ag tachtadh ár dteanga…. Agus ná dearúdtar é seo a rá – Nollaig Shona agaibh go léir. Go mbeirimíd beo ag an am seo arís! Foilsiú: 24/12/2008 . igaeilge a d’fhoilsigh. Ranganna: An Ghaeilge, Cúrsaí Reatha, Cultúr. Clibeanna: An Ghaeilge, an tAire Ó Cuív, Maorláthas Ar Mire, `.